SWT FLOW CONTROLS provide an easy, efficient way to reduce water usage and waste. Choose from machine fabricated PVC Flow Controls, PVC Flange Disc Flow Controls, External Backwash Flow Controls, Flo-et Brass and Stainless Steel Flow Controls, and Flo-Controlet™ Flow Controls. These flow controls are designed for 20 to 120 psid before the flow control. Back pressure after the flow control likely will reduce the flow rate to a gpm below the design parameters of the flow control. Increasing pipe size and drain size after the flow control could eliminate potential back pressure. SWT’s PVC Flow Controls are machine fabricated to exacting standards. They are available with male thread, female thread, or spigot connections to match your application needs. These simple to install units can control liquid flow rates from 0.25 to 20 gpm (0.9 to 75.7 lpm) and are constructed of corrosion-free machined PVC. Available in other plastic materials (CPVC, Teflon, ABS, etc). Contact SWT for details. 4.0 gpm (15.1 lpm) flow only available with SM-FC7M7M. Metric sizes available. Contact SWT for details. SWT’s PVC Flange Disc Flow Controls are machine fabricated to exacting standards. 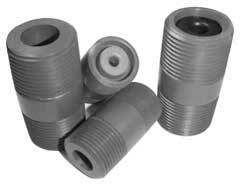 They are available with ANSI or DN flange bolt patterns to match your application needs. These dependable, long-lasting units can control liquid flow rates from 5 to 1,000 gpm (18.9 to 3,785 lpm) and are constructed of corrosion-free machined PVC. 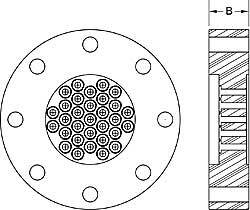 * Flange disc is without bolt holes and fits inside of bolts between two mating 6 inch ANSI flanges. ** Number of inserts and GPM/LPM are flexible. Fully Automatic Metering Flow Controllers are designed to maintain a constant liquid flow with changes of inlet pressure from 30 to 120 psi. Water softeners, filters, cooling towers, irrigation, industry, recreation, etc. Models available with flow rates from 0.25 to 540 gpm (0.9 to 2,044 lpm).